Have dual activity against asexual and sexual stages (gametocytes) for treatment and transmission blocking. For advanced series, we are seeking novel compounds with, ideally, a predicted human half-life >100h and a predicted single human dose <500mg or three day human dose of <50 mg. Novel whole-cell phenotypic screening paradigms to potentially identify new relevant chemistry. Asexual blood-stage assays for vivax, malariae and ovale malaria. The template and instructions for the 3-page Letter of Interest can be found in the right-hand column of this page. 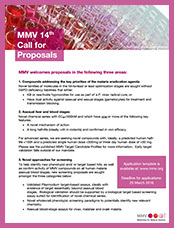 All applications using the specified templates should be sent to proposals [at] mmv.org by 12 noon CET 25 March 2016.